There was a discussion over on the 'Two Peas In A Bucket' forum that asked if anyone has issues scrapping 'out of season' photos/layouts. For the most part, I don't. The only holiday/season I just can't bring myself to scrap out of season is Christmas. With that being said - I was in a 'fall' mood when I scrapped this and decided to get the few Thanksgiving photos I had out of the way. I made this layout from a pretty basic sketch that I doodled up myself. My main goal was to work in a few layers of papers with tabs on them. I really like the look of tabs as opposed to flat edges. I think it makes layering all the more interesting. 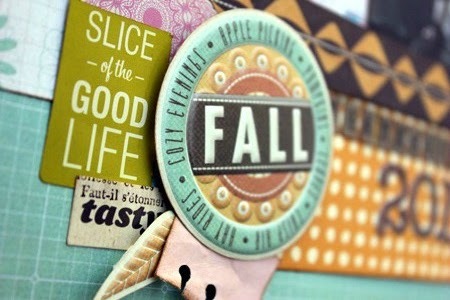 The orange dotted paper and the brown and orange strip are from American Craft's Night Fall collection. The chevron paper and pink paper are from American Craft's Dear Lizzy collection. I wish I could tell you where the grid paper and the floral background paper are from but I honestly have no idea! They were sitting in my scrap basket with no name to claim. The title is is made up of alphas via sticker sheets from Crate Paper's Emma's Shop and Simple Stories' Fabulous collection. The round 'fall' embellishment and leave stickers are from American Craft's Nightfall collection. The little pie in the corner is also from American Crafts. The sticker at the very top and the 'Slice of the Good Life" sticker are both by Amy Tangerine. The pink paper bits that are spread out near the embellishments are all either punched out from my Fiskar's postage punch or my EK Success Binding edge punch. The "tasty" sticker is from American Craft's Dear Lizzy collection and the pink doily is from the sticker sheet that came with Simple Stories' Fabulous collection. Love all the random goodies and the layering! fun!! love it! Love the latout, Christina! Cute! I have no problem scrappin out of season either! I feel like I am always scrapping out of season actually--- haha! 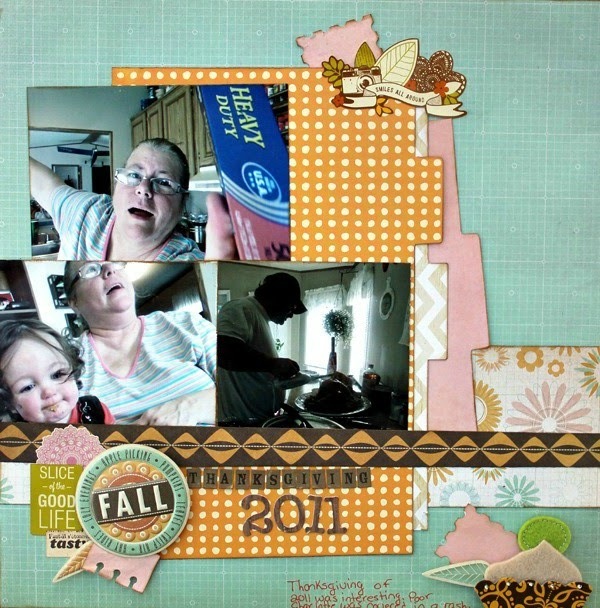 Oh, I just did a Thanksgiving layout too...I agree...can do all the seasons...Christmas might be a little tricky. Love your mix of products...beautiful! Christina: Hi again! This layout is super duper adorable. Great job with this one! Hope you're having a great week, and stop by to say hello sometime soon! Uhhhhh dude. Why are you NOT submitting to magazines? They would be idiots not to snag you up!! !